If massive bee die-offs are not enough, neonicotinoid pesticides are causing millions of bat deaths and are contributing to many other wildlife declines. Researchers conducted an in-depth review of existing literature and report their findings in the Journal of Environmental Immunology and Toxicology. Strong correlations are found in the rise of neonicotinoid pesticides and Colony Collapse Disorder, as well as plummeting wildlife populations in areas where the chemicals are heavily used. Outbreaks of infectious diseases in many wildlife populations, including fish, amphibians, bats, and birds, coincide on a temporal and geographic scale with the emerging use of the pesticides. Non-target insects are also being wiped out, depriving wildlife of a food source. How could this new class of pesticide have such a devastating effect on so many types of wildlife? Neonicotinoid pesticides are designed to disrupt the central nervous system. While very effective on pests, they are not specific to pests and appear to work on all animal life forms from invertebrates to mammals. In the case of honey bees, for example, the neurotoxins can kill them outright or cause “sublethal” effects such as disrupting their ability to forage. The researchers hypothesize that neonicotinoid pesticides have another sublethal effect by damaging the immune system of a variety of wildlife, making them more susceptible to infectious disease outbreaks that correlate with use of the pesticide. This is thought to be a contributing factor in the bees’ inability to ward off the Varrea mite that is a factor in Colony Collapse Disorder. Even after treatment for the mite, honey bees still cannot fight off the mites enough to prevent collapse. Is this the new DDT? Unlike some other biocides, neonicotinoids are persistent in the environment, meaning that they do not break down quickly. These pesticides are typically applied to crop seeds. The chemical is ingested into the plant and travels to the growing shoots and flowers, where it is toxic to anything that eats any part of it. Honey bees take toxic pollen back to their hives where it wreaks havoc. The chemicals are also applied as a soil treatment. When it rains, the chemicals get washed into aquatic ecosystems. Here is where it damages amphibians and other aquatic organisms. New and devastating pathogens were discovered in frog species after the emergence of neonicotinoids. Another study found that exposure to low but constant concentrations of the pesticides has lethal effects on freshwater invertebrates. Experiments on native freshwater shrimps found that this type of exposure impaired their mobility and feeding behavior, leading to slow starvation. Invertebrates are critical links in aquatic ecosystems. In 2012 it was reported that 6.7 million bats died in the U.S. due to a new pathogen called White Nose Syndrome. This fungal virus began decimating bat populations as the use of neonicotinoid pesticides ramped up in the early and mid-2000s. Bats feed on insects, and exposure to small cumulative doses of the chemicals reduces bats’ immune response, thereby leaving them susceptible to White Nose Syndrome. Something so “effective” in the chemical agriculture system, as neonicotinoid pesticides are, is bound to have negative repercussions in the environment. The motivation is profit, and there is no profit in being concerned for wildlife. Producing chemical solutions and genetically-engineered, patented crops is the obsession of Bayer CropScience and its cohorts in the industry. And the U.S. government is a willing co-conspirator. While Europe has enacted a ban on neonicotinoid pesticides, the U.S. plows on as if nothing is wrong. Authorities have already ruled out disease, including the infamous “Colony Collapse Disorder” (CCD), as the cause of a recent honeybee holocaust that took place in Brevard County, Florida. The UK’s Daily Mail reports that up to 12 million bees from roughly 800 apiaries in the area all dropped dead at roughly the same time around September 26 — and local beekeepers say pesticides are likely to blame. CCD is the term often used to describe the inexplicable mass die-off of honeybees around the world, which typically involves honeybees leaving their hives and, for whatever reason, never finding their way back home. 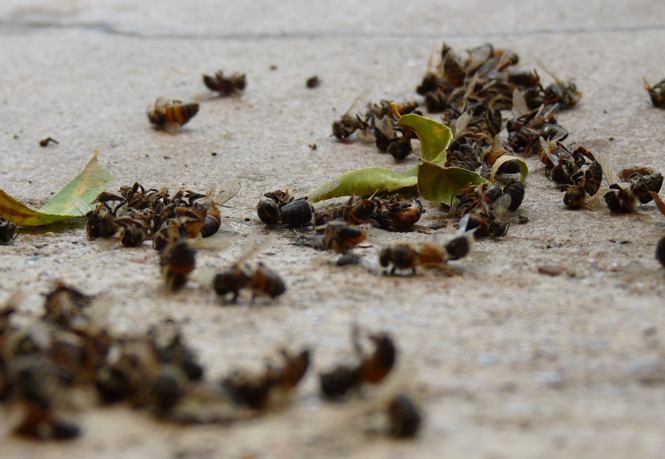 Mass die-offs associated with CCD often occur at seemingly random locations around the world, and typically involve a gradual process of disappearance and eventual colony collapse — and the dead bees are typically nowhere to be found. But the recent Florida event involved hundreds of colonies from 30 different sites in a one-and-a-half mile radius literally dropping dead all at the same time and leaving their carcasses behind, which is why authorities have dismissed CCD as the cause. Based on the appearance of the dead bees, as well as the synchronous timing of their deaths, pesticide sprayings appear to be the culprit in this case. The Florida die-off coincides with a recent county-wide mosquito eradication effort, during which helicopters flew over various parts of the county and sprayed airborne pesticides. Officials, of course, deny that this taxpayer-funded spraying initiative had anything to do with the bee genocide, though. Many of the beekeepers who lost their hives in the mass killing raised their bees to sell to American farmers, who then used them to pollinate food crops. Because of their massive losses, many of these beekeepers could end up losing their entire beekeeping businesses.